Approximately 66% of the present population of the Island of Ireland are descendants of ‘Native Irish Gaels' who were themselves a fusion of prehistoric and Celtic peoples who occupied the Island virtually uninterrupted until the Vikings arrived in 795 AD. Medieval Irish society was intensely hierarchical, where status mattered, and where clear distinctions were drawn between Kings, Cleric, Poets and the free and un-free. It mattered who you were in this society! 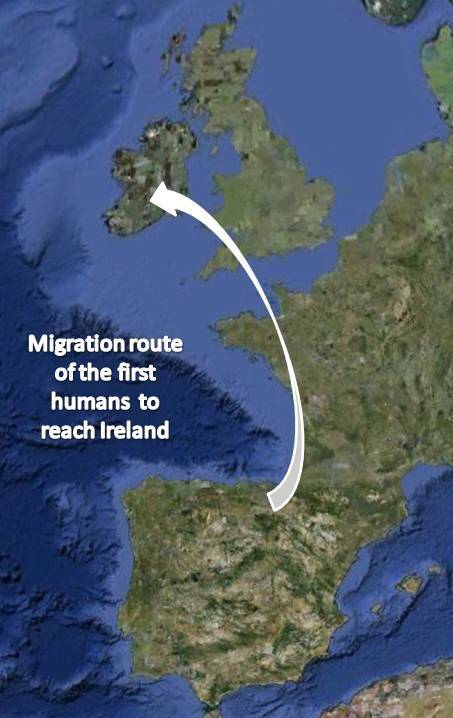 It is no coincidence that Ireland therefore was the first European Country to adopt (from about 800 AD onwards) inherited paternal Surnames, which were typically denoted by either 'Mac’ or 'O' meaning ‘son of’ or ‘grandson of' respectively. Surnames of this nature were an early form of genealogy. They immediately informed strangers as to where you were from, and to whom your allegiances lay. These Surnames are different from English Surnames which typically denoted a persons profession e.g. Smith, Forrester, and Taylor, or where they lived or originated from e.g. Townsend, Hill, and York. What is even more amazing is that scientific research has revealed that most (if not all) of the estimated 1,800 distinct Irish Clans may each in turn have had a single founding ancestor, or potentially 1,800 Adam's. 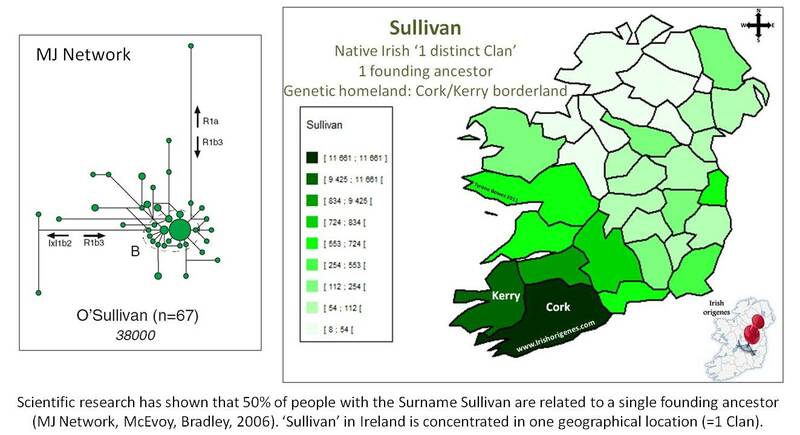 For example, research has shown that the Surnames ‘Sullivan’ and ‘Ryan’ both have a single founding Ancestor and that both these Surnames are associated with a single geographical location. Even more amazing is that after 1,200 years there is a 50% chance that one is still directly related to this founding Ancestor, who first picked or was granted his own Surname. 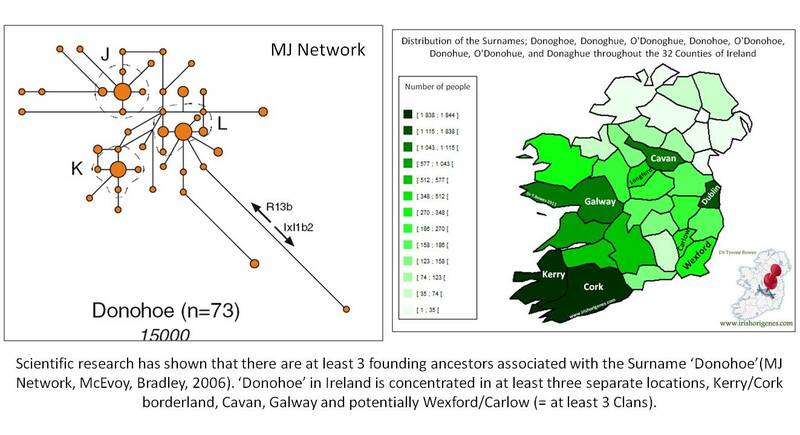 I have discovered that if scientific research has shown that there was more than one founding Ancestor associated with a Surname, then there was more than one distinct Clan, typically living in different parts of Ireland. For example, the Surname ‘McGuinness’ has 2 founding Ancestors corresponds to 2 distinct Clans found geographically quite far apart. The Surname ‘Donohoe’ has at least 3 founding Ancestors representing at least 3 quite distinct Clans found in separate parts of Ireland. If you have had a Y Chromosome test and you have received your results in the form of many dozens of unfamiliar Surnames of people with whom you share a common Ancestor, you may well (like me) have asked yourself, why so many different Surnames? What happened? How can I share ancestry with these guys? The answer is quite simple. Some of these Surnames are literally a snapshot of your Ancestors relatives and neighbours from about 1,000 years ago (the time when Surnames were first used). For example, my own closest genetic matches are with people called ‘Carroll’ and ‘Dooley,’ when I plot where these Surnames occur it is no coincidence that they (and my own Surname ‘Bowe’) are concentrated in County Laois in Ireland. County Laois is where my ancestor was living when he first took his Surname. Put simply, although my Ancestor took the Surname 'Bowe,' his distant relatives who lived close by, took the Surnames 'Carroll' and others 'Dooley.' Hence one can view the Surname distribution maps that I have created to find out where their ancestor lived in medieval Ireland. If your ancestors were there 1,000 years ago, they were probably there for 100’s if not 1,000’s of years before that and their descendants (and your distant relatives) still live there today. 1. Irish Surnames have been extensively anglicised giving rise to many variations of the same Surname. Common variants of Surnames are included in the database and will guide you to the original Surname. 2. After more than 1,000 years only 50% of people have retained their original Surname. Hence you can expect at least 50% of your Surname matches to have absolutely no connection to your shared founding ancestors Surname. These are a result of what a Scientist would call a ‘non-paternal’ event, usually a result of adoption, or maternal transmission of Surname. A Y-chromosome signature of hegemony in Gaelic Ireland. Moore LT, McEvoy B, Cape E, Simms K, Bradley DG. Am J Hum Genet. 2006 Feb;78(2):334-8. The scale and nature of Viking settlement in Ireland from Y-chromosome admixture analysis. McEvoy B, Brady C, Moore LT, Bradley DG. Eur J Hum Genet. 2006 Dec;14(12):1288-94. Y-chromosomes and the extent of patrilineal ancestry in Irish surnames. McEvoy B, Bradley DG. Hum Genet. 2006 Mar;119(1-2):212-9. In the name of the father: surnames and genetics. Jobling MA.Trends Genet. 2001 Jun;17(6):353-7. 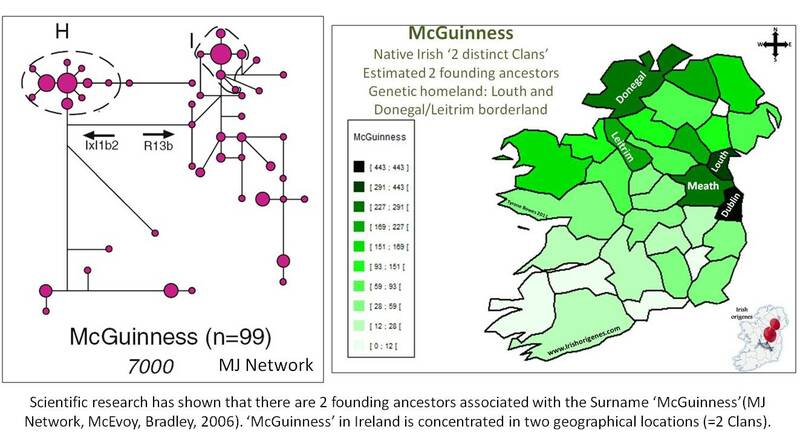 Y-chromosome variation and Irish origins. Hill EW, Jobling MA, Bradley DG. Nature. 2000 Mar 23;404(6776):351-2.